Welcome to a new week! This winter has been so uncharacteristically mild here in the Northeast – I can hardly believe it’s almost February and we’ve had just one snowstorm so far!! It’s heavenly for this summer-loving girl……not so much for my ski-bunny babies! I hope the winter hasn’t been too rough on you thus far either! No matter the season, I am a hand-and-face-cream addict, always trying to combat the elements and keep my skin hydrated. 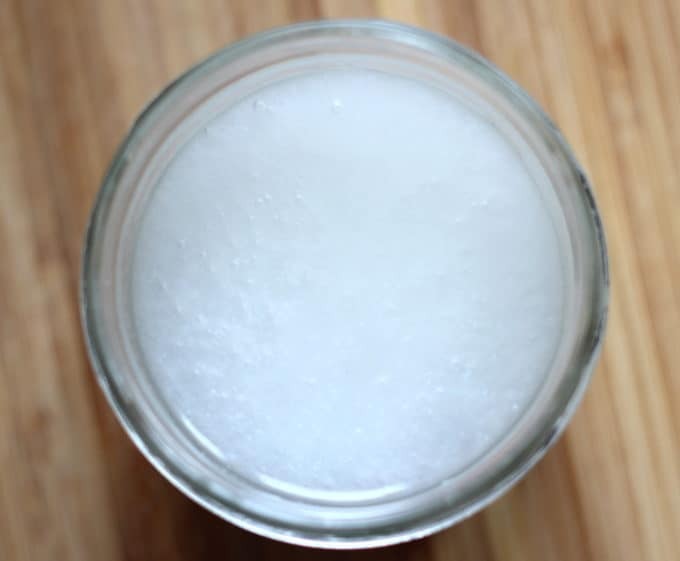 A few years ago I started making my own sugar scrub, which is an amazing exfoliant that is especially great for DIYers who are constantly scrubbing paint off their hands 🙂 This coconut oil is another fantastic way to keep your winter face and body moisturized. 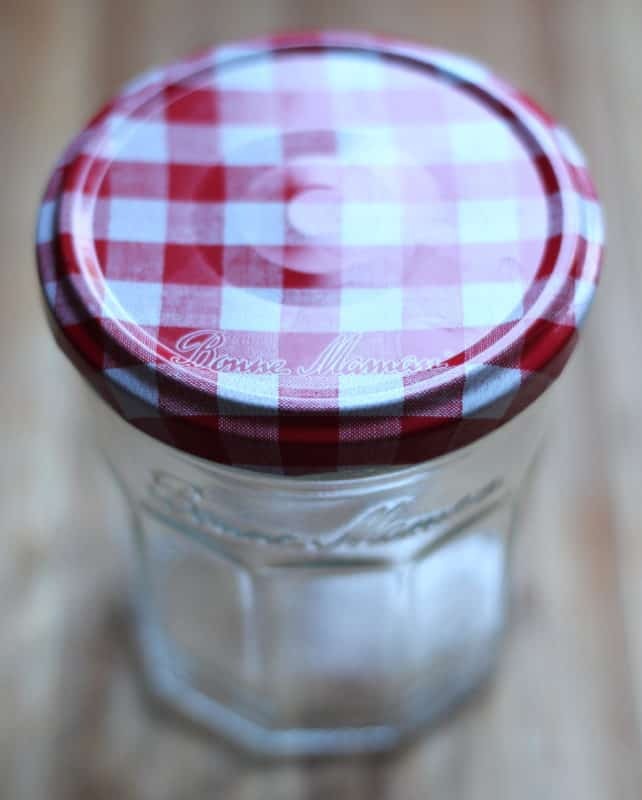 Keep a jar in your kitchen for your hands, or use it all over when you get out of the shower (let it absorb for a few minutes before you get dressed), and on your face and lips before bed. I have super sensitive skin and one of my kids is eczema-prone, so I love how gentle this little concoction is. Find a jar. I hoard small glass jars from the recycle bin and am especially fond of the size, shape and lid of my favorite jam, Bonne Maman (your fave too?) This jar holds 13 oz. 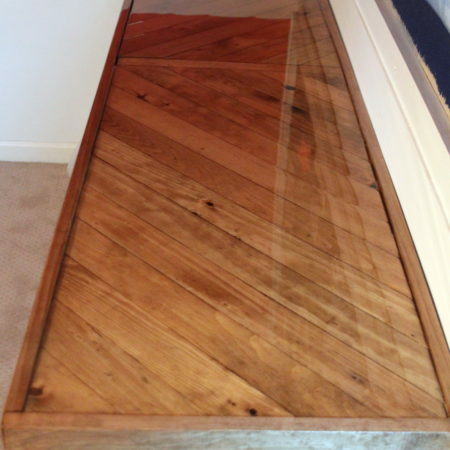 – adjust your ratio of ingredients according to the size of your container. Mason jars are good for this too. Per every 3 oz. 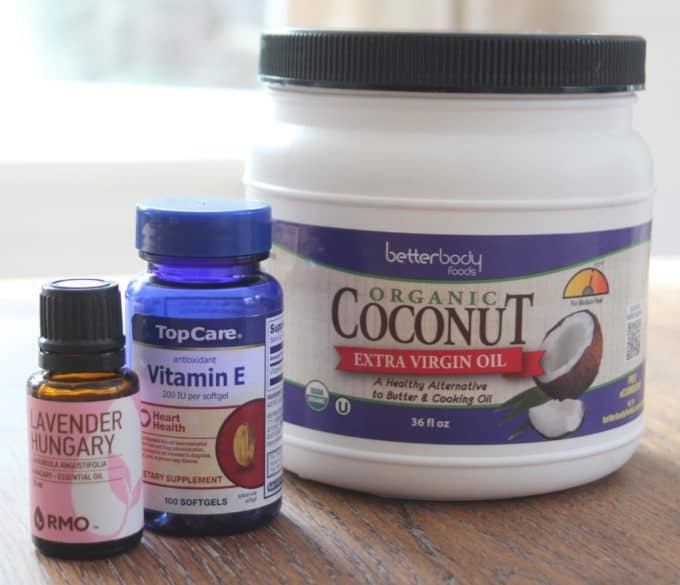 of liquefied coconut oil, add 1 vitamin E capsule + 3 drops of essential oil. This is my personal preference and you can adjust those amounts however you’d like! Melt the coconut oil. 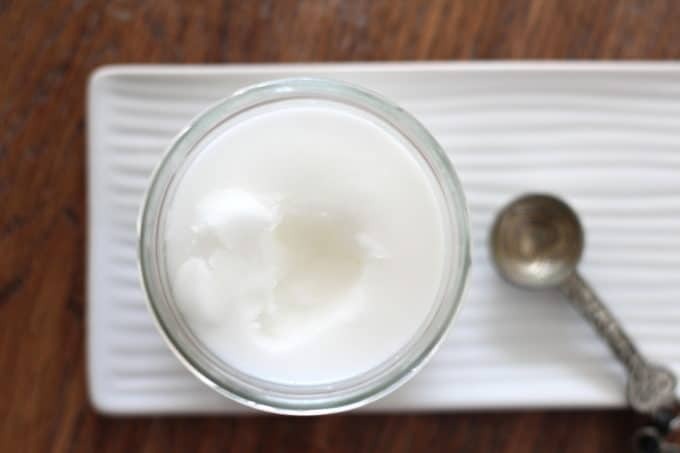 Coconut oil is solid at room temperature, so to mix it with the other ingredients, first spoon it into a microwaveable measuring cup and microwave for about 30 seconds, then whisk to liquefy it. 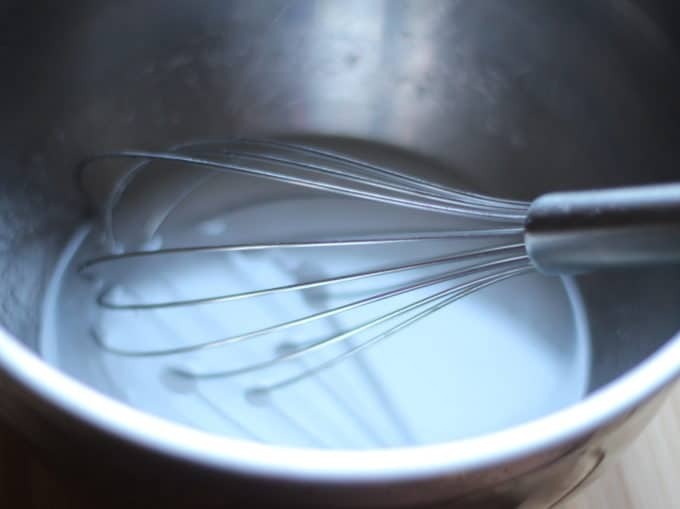 Loosely packed solid coconut oil will reduce by about half when liquefied. I poured it into a mixing bowl. 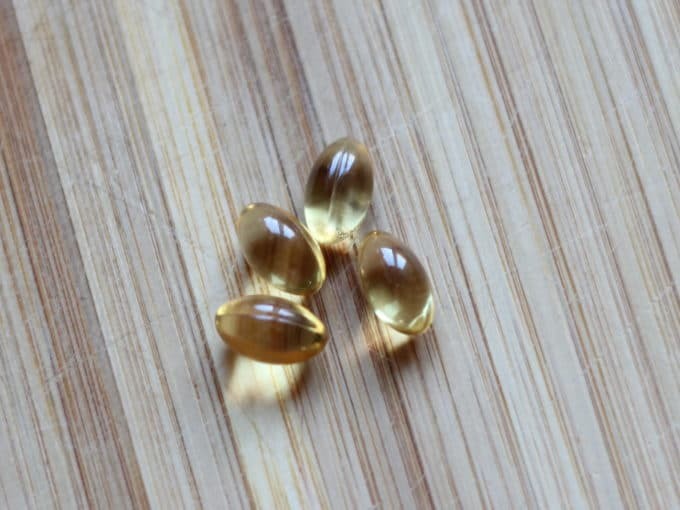 Add vitamin E. Use scissors or a pin to pierce the capsules and squeeze the contents into the oil. Add lavender essential oil. I have used essential oils from various companies and recently tried Rocky Mountain Oils. 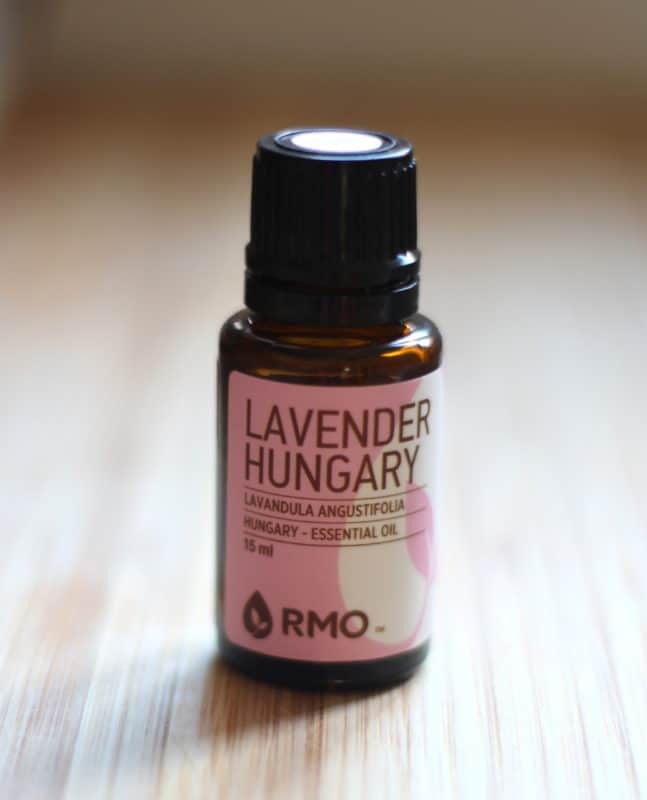 The Hungarian Lavender is quite a bit stronger smelling than regular lavender so I use it sparingly. Regular lavender oil is great if you have that on hand. 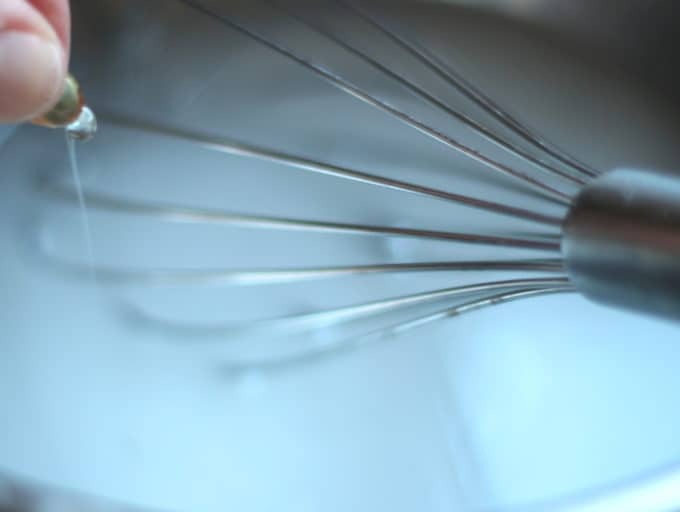 Add the essential oil a drop at a time until you are happy with the strength and whisk to combine the coconut oil, vitamin E and lavender really well. Pour the concoction into your jar. Go ahead and use it on your hands. Massage it into your cuticles and take a moment to enjoy the scent and feel of it. The liquid will eventually return to a solid state (you can put it in the fridge to expedite this, but it’s not necessary), When you put it on your skin, it warms up and becomes a clear oil again. As with the sugar scrubs, if you give this as a gift, it’s a nice touch to include a little spoon for scooping it out (particularly helpful when you get to the bottom of the jar). When I made sugar scrubs for gifts one Christmas, I bought a package of cute, decorative tea spoons and included one with each jar; espresso spoons are really small and perfect for something like this too. 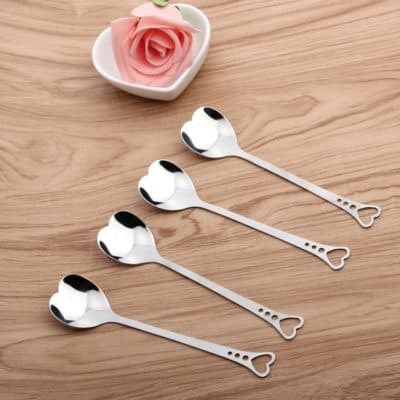 I ordered these spoons for Jimmy to include with his Valentines gifts. These copper ones are cute too! 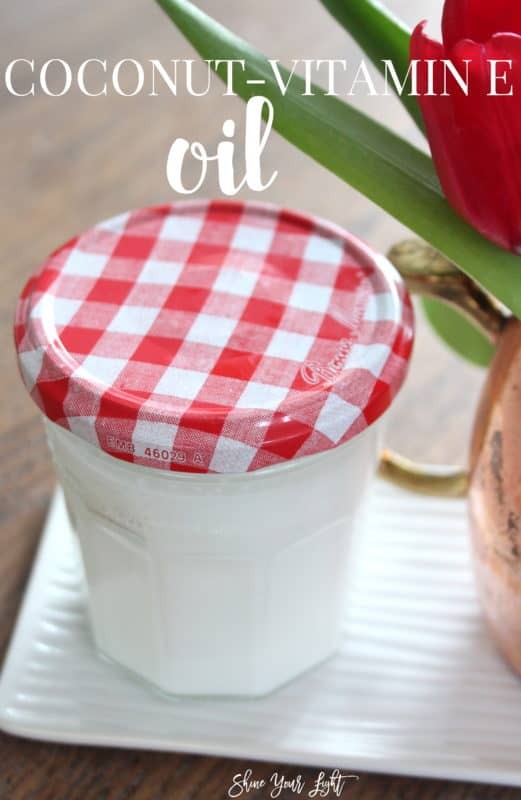 Makes me think coconut oil or a sugar scrub would be a fun thing for a group of tween girls to make at a birthday party and take home with them with one of these. 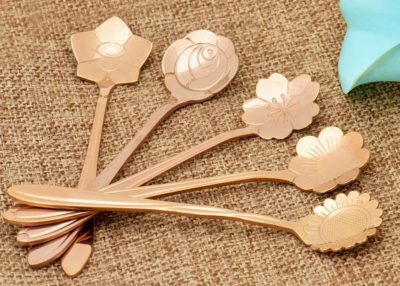 You could probably find little decorative spoons like this at Homegoods or Marshall’s Boutique. 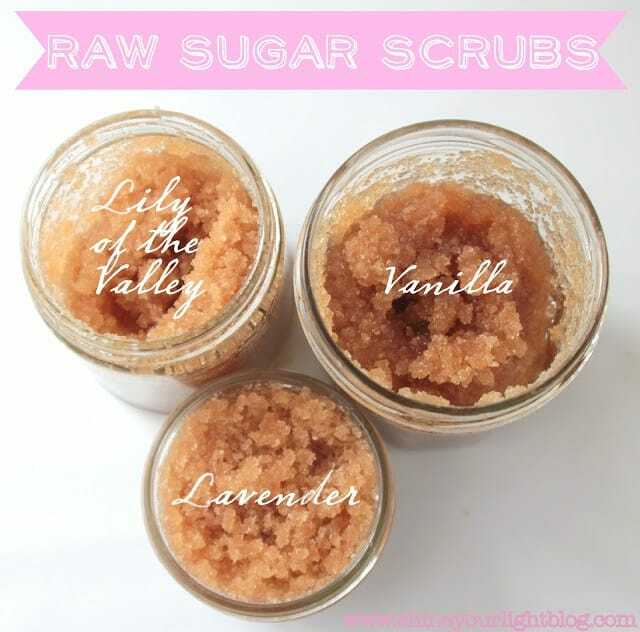 Get the “recipe” for my raw sugar scrubs here! I’ll be back on Wednesday along with the My Five Favorites team and a special guest host to chat about how we show a little love around Valentines Day! Thanks so much for stopping by today. A Craft For The Uncrafty!! Sounds great, Lisa! 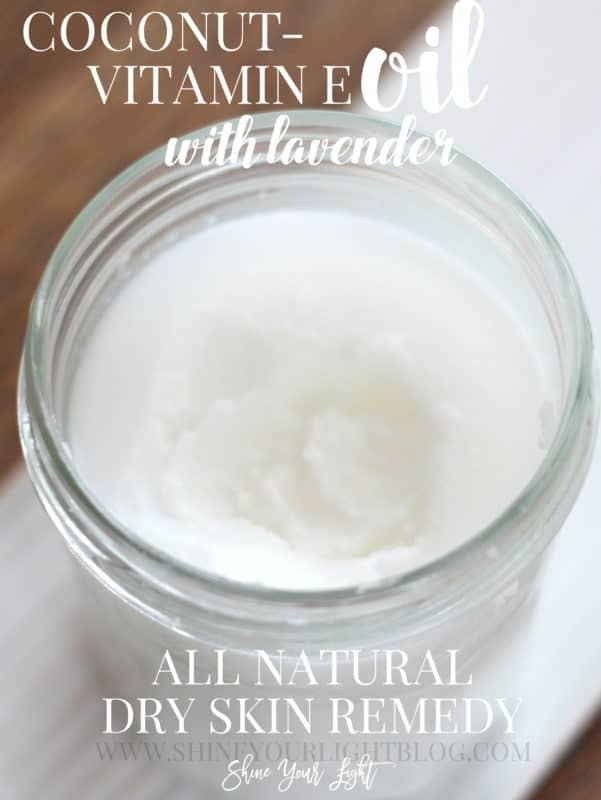 I use coconut oil to moisturize with but I should add some Vitamin E and lavender! You’re right, this winter has been pretty mild. Luckily, Vermont has some good snow – much better than last year. We’ve been up several times to ski this winter and plan to go up a few more. My kids are wishing for some snow in NJ – and some snow-days! You never know what February and March will bring! Enjoy your week! Shelley my son is going to college in Vermont next year so we will be spending a lot of time exploring up there. He can’t wait to snowboard all the time – his school has a shuttle to mountains around them. So glad you’ve been able to get up there and enjoy some family time! Sounds wonderful! I would add one tip: be careful of letting any of this oil go down the drain, as it will harden an clog your plumbing! 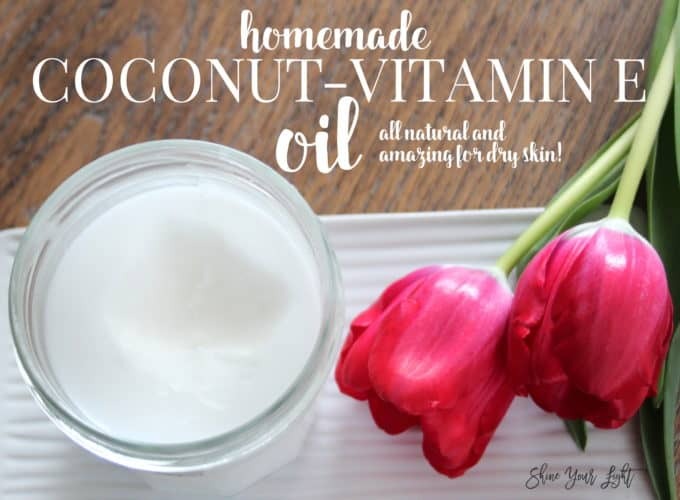 Love coconut oil for its versatility- moisturizing, cooking and many other uses. Yes that’s a good point about using it to shave your legs. And yes – so many uses! 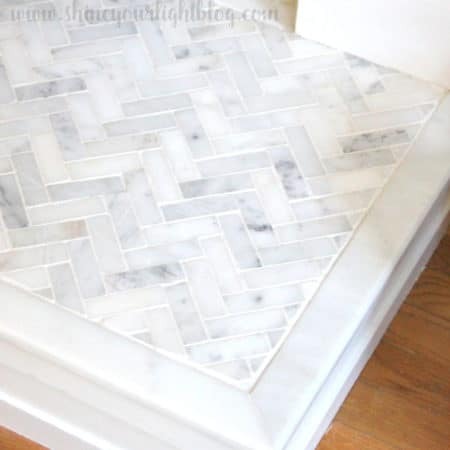 i should make this for sawyer; he suffers from bad eczema on his shins. It’s great to put on before right after a shower and before bed. Hope it helps him! I have a bottle of liquid Vitamin E. Will that work instead of the tablets? If it will, how much should I use? Thanks! Hi Sandra! I just looked at my Vitamin E capsule bottle and can’t tell how much is in each one. I would guess that a few drops of your liquid would do the trick! I would venture to say each capsule’s contents are about the size of a nickel.